We love referrals! In fact, that's how most of our loyal customers come through our doors for the first time. Please help us spread the word about the great services we offer. 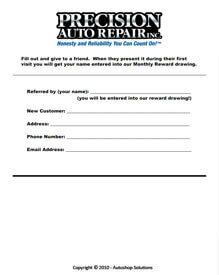 Refer us to your friends, neighbors, colleagues and anyone that you know that drives an Acura, Honda, Lexus or Toyota vehicle. We will help make sure their vehicles are well maintained and always get them to where they need to go! In return, we'll enter your name into our Monthly Rewards Drawing. Fill out the form with your name, address, etc.